Never in a million years would I have thought as a child growing up in a Southern California seaside town that I’d end up living in small-town Costa Rica. When people ask me how I came to live in Costa Rica, it’s an unusual story to tell. My first career as a newspaper journalist opened the doors to an international life in St. Petersburg, Russia, where I moved to in March 1992 after the collapse of the Soviet Union. For several years I worked as a journalist, in business management, and in a travel agency and used my time here to see more of the world. After six years, I had grown weary of the long, cold, dark Russian winters. Not yet ready to return Stateside, I was looking for a new adventure, preferably in a warmer climate and closer to California. Through business connections, I ended up doing a two-week investigatory visit to Costa Rica at the end of 1998. By May of the following year, I’d moved there. Over the years in Costa Rica, I have worked doing many things: tour guide, tour operator manager, hotel manager, wine sales, co-owner of a construction business, and online marketing. I even returned to California for a couple of years in the middle, and then a job far cooler than I could get there lured me back to Costa Rica: Helping to manage a jungle lodge. Hanging out with monkeys and parrots on a jungle beach…I sure couldn’t do that in California. Ten years ago, I met my Costa Rican husband Rolando when we were both working on the same hotel project on the central Pacific coast. But after a few years, the heat of the coast and the stress of a large hospitality business prompted us to move. We chose the charming town of Atenas in the mountains west of the capital San Jose. It’s perfectly located only 30 minutes to the international airport and the nearest big city, it’s just under an hour to San Jose, and we can also be at the beach in less than an hour. And the climate in Atenas suits us, it’s a pleasant 80 F during the day and low 70s to mid-60s F at night. 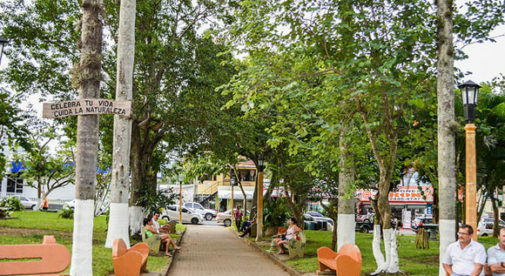 It’s a peaceful, coffee-growing and ranching town of about 27,000 friendly residents and a growing international expat community. We bought our home on a half-acre of land in a rural Atenas neighborhood six years ago where we live happily with five dogs, two cats, and a dozen or so birds. The Central Valley area of Costa Rica has “grown up” a lot over the years—new highways, a myriad of restaurants serving cuisine from all over the world, a vibrant cultural scene, high-tech movie theaters, business centers, shopping malls, cheap good-quality cell phone service, modern internet, and satellite TV. Atenas, thankfully, remains a small town, and that’s what we love about it. I like going to our local pizzeria where the waiters know my name, attending yoga classes at the Atenas Yoga Center, and having lots of local expat community groups to join if I want. This is still a place where people wave to each other as they drive down the streets. I often run into at least a dozen people I know at the supermarket or farmers’ market and stop for a chat. We have expat rock bands, a monthly English-language online newspaper, several expat Facebook groups, and volunteer organizations. And I have friends from all around the world here; Italy, Britain, Canada, Germany, Nicaragua, the U.S….life in Atenas really is international living. In Costa Rica, I Have the Beach Life I Could Never Afford in the U.S.